Identifying opportunities for service innovation and exploiting them requires novel capability building in the rapidly changing business environments. This study extends the existing literature on dynamic capabilities in service innovation by operationalizing the capabilities of sensing and seizing new opportunities. The purpose of this chapter is to examine how futures thinking and design thinking can facilitate service innovation from the dynamic capabilities point-of-view. 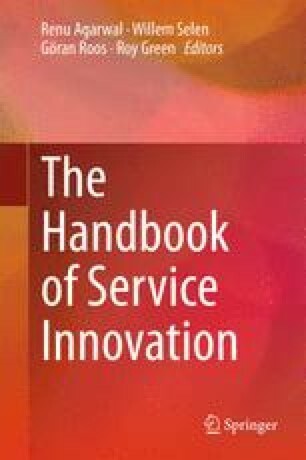 As a result this chapter provides a conceptual framework for service innovation process that is grounded on foresight and service design. To synthesize the literature into a new conceptual framework, this chapter is based on a large body of literature from four burgeoning fields of study: dynamic capabilities, service innovation, foresight, and service design. The key point the chapter wishes to make is that a forward look at new methodological perspectives in service innovation is needed and that integrating the methods and tools of foresight and service design to the service innovation process provides a promising new avenue to future success.